Partnering with Merritt Group and Professional Services Council, Market Connections will share results from the 2018 Federal Government Contractor Study. The study focuses on top challenges and best practices of contractors with higher win rates, including the most effective marketing and business development activities and key strategies to remain competitive. In our 10th year, the Federal Media and Marketing Study provides a comprehensive review of the media and buying habits of federal decision-makers across the country. With over 3000 respondents, this survey details more than 20 different job functions and maps them to individual media usage spanning print, broadcast, social, mobile and digital. The days of marketing departments as a hit to the bottom line are a thing of the past. In 2018, marketers provide more value than ever for companies as strong branding and positive customer experiences support long term growth. For those working in the highly competitive federal market, with its unique challenges and regulations, a strong marketing department working closely together with business development is crucial to winning business and should be budgeted for accordingly. Is Your Brand a Leader in Your Market? Your brand is a critical contributor to the value of your company. From overall awareness to specific perceptions, your brand carries the weight of your company’s mission wherever it goes. Both consciously and sub-consciously, your brand is constantly evaluated by your prospects and compared to your competitors. Your brand perception in the market is the floor for the evaluation of all your products and services. It’s important to know where you are starting from and your strengths and weaknesses. 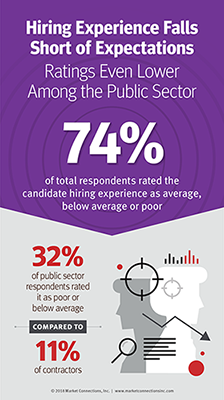 A majority of public sector and government contractor HR and recruiting professionals are struggling to recruit and retain top talent. A recent survey by Market Connections and Monster Government Solutions sheds light on the ongoing challenges with government and government contractor hiring and retention and will help your organization develop and improve the right strategies and best practices to recruit and retain the best candidates.